We love a good stamp here at Design Week, and this effort from the Irish post office An Post really pushes the envelope (sorry). Featured within its 40x30mm dimensions (that’s regular stamp size, philately fans) is an entire short story – all 200 or so words of it. 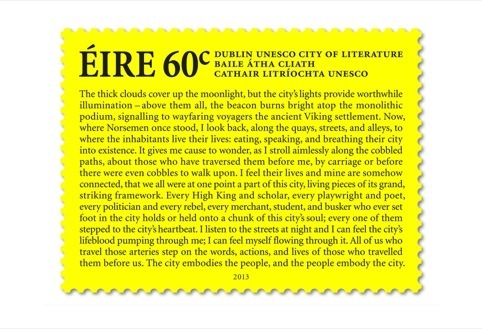 Designed by Amsterdam-based consultancy The Stone Twins, the stamp is being released to celebrate Dublin’s status as a UNESCO City of Literature. 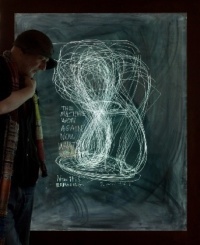 Instead of relying on somewhat clichéd words or images from the giants of Irish literature (Joyce, Yeats, Wilde etc) The Stone Twins worked with Roddy Doyle’s Fighting Words creative writing centre to run a competition inviting young people to write a new story for the stamps. The competition was won by teenager Eoin Moore, who penned this evocative prose which aims to capture the essence of Dublin. To increase standout and readability, the stamps are printed with black text on a fluorescent yellow background. When it comes to innovative stamp design, the Irish have got it licked (again, I’m very sorry).